Raise a fork for a great cause! 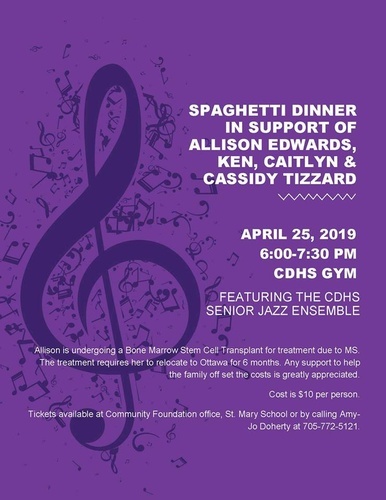 This event is being organized by St. Mary Catholic Elementary School and Amy-Jo Doherty to help with costs associated with Alison's stem cell bone marrow transplant for her MS. The CDHS Senior Jazz Ensemble will be featured at the event. Thursday April 25th from 6:00 to 7:30 p.m.
Tickets - $10.00 per person Available at St. Mary School, through Amy-Jo or at the Community Foundation office - 39 Doxsee Ave. North.